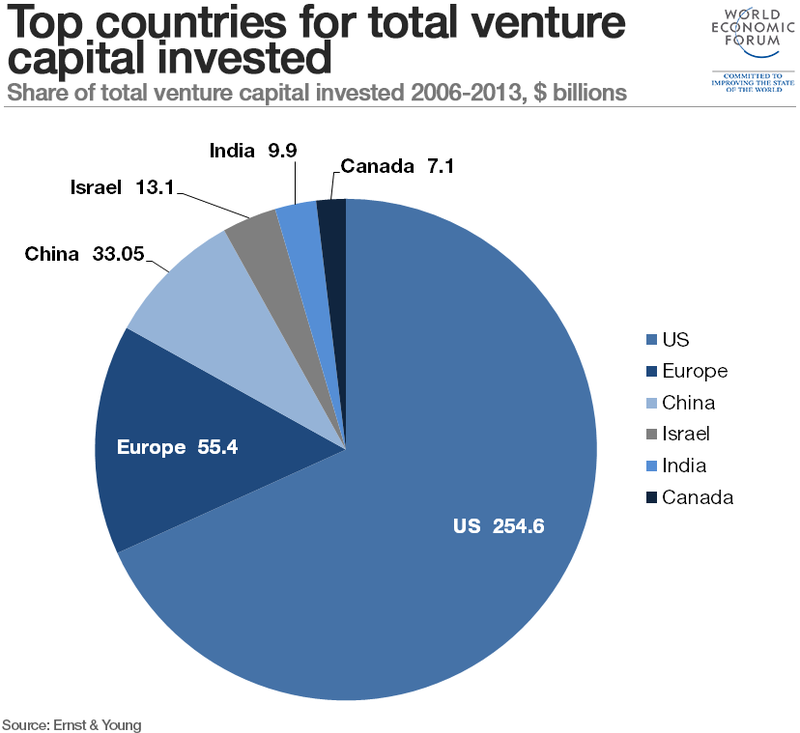 Which countries have the most venture capital investments? Venture capital that investors like Marc Andreessen or Peter Thiel put into high-potential start-ups such as Twitter, Facebook or Alibaba is on the rise – and, like the sun, it’s rising in the east. The United States, most particularly the Bay Area, continues to be the largest recipient of investments, according to a study by Ernst & Young. But China and India, the largest emerging markets for venture capital, are closing in, doubling their share of the global market in just a few years. Taken together, China and India now account for a quarter of the venture-capital market. In Europe, Germany has for the first time surpassed the United Kingdom, signalling a growing start-up scene in cities such as Berlin. Overall, 2014 was the best year for the sector since 2001, with almost $87 billion worth of investments globally, according to the study, a rise of some 60% compared with 2013, when venture capitalists invested some $54 billion. But due to the rise of the East, the US, Europe, Canada and Israel each saw their share in the total decline. They now make up about 75% of the market, whereas in the previous period they totaled almost nine out of every 10 dollars invested in venture capital. In that period, a total of about $373 billion was invested in venture capital worldwide, a number equivalent to Thailand’s GDP. The country in which most venture capital was invested in that time was the US, with about $255 billion (or almost 70% of the total). The European countries came in second, with some $55 billion invested (or just over a fifth of the amount invested in the US). Of the emerging economies, China and India made a mark, with $33 and $10 billion invested respectively (or about 9% and 3% of the total). The same countries and regions dominated the venture-capital market last year, but the proportions have changed. The US still came in first, with about $52 billion. But its proportion of the total fell to just over 60%, compared with 70% in the eight years previously. Europe went through a similar evolution: its global proportion fell from 15% to 12%, though its ratio versus the US of about one to five remained intact. The countries that made a big jump were the large emerging economies – China and India. In a single year, the proportion of Chinese venture capital in the global total doubled, from an average of 9% from 2006 to 2013, to 18% in 2014. In one year, Chinese venture capitalists invested half of the amount they had invested in the previous eight years combined. As a consequence, China surpassed Europe as the world’s second-largest market for venture capital. A similar jump happened in India, which saw its proportion of the global market for venture capital double to 6% in 2014. 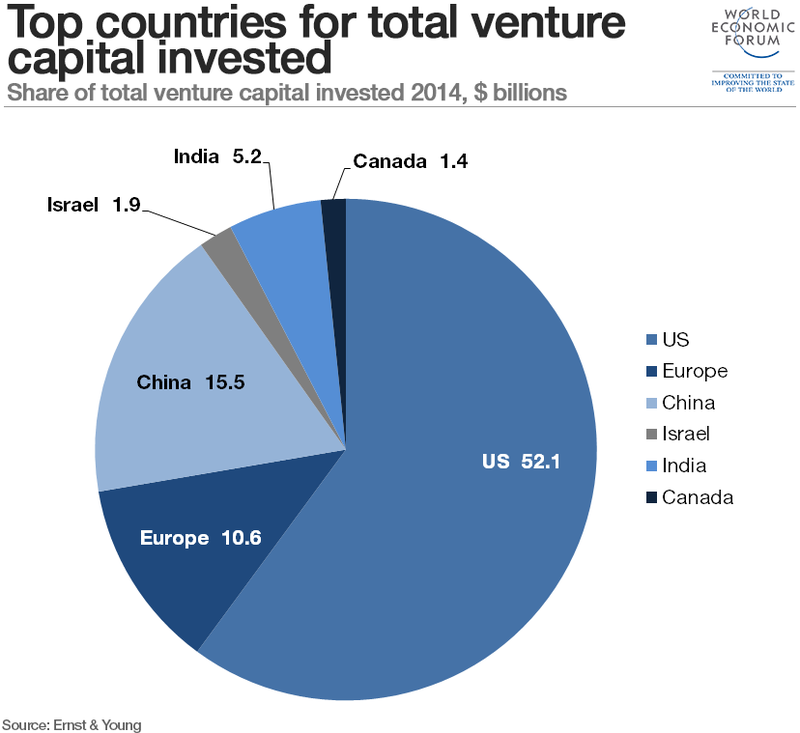 Doing so, it surpassed Israel as the fourth-largest market for venture capital. Going one step deeper, to the country or regional level, the Ernst & Young numbers show that Silicon Valley (or the Bay Area) is still the largest region for venture capital, with almost $25 billion invested. But three other US regions also make the top five: New York ($5.3 billion), New England (including Boston, $4.8 billion) and southern California ($4 billion). In Europe, Germany and its hotspot Berlin surpassed the UK and London for the first time in over five years, coming in at $2.8 billion versus the UK’s $2.7 billion. In the emerging markets, Beijing is the largest recipient, with $7.7 billion of venture capital investments, ahead of Bangalore ($2.2 billion) and Shanghai ($2.1 billion). So, does this mean that we’ll see more Alibabas coming from China and India, going forward? And is the evolution towards more venture capital good? Could Berlin be the next Silicon Valley? To learn more about venture capital and its impact on the economy and society, read our recent report, An Introduction to Alternative Investments. You can download it here. We must build resilience to face the future - but will we be fast enough?